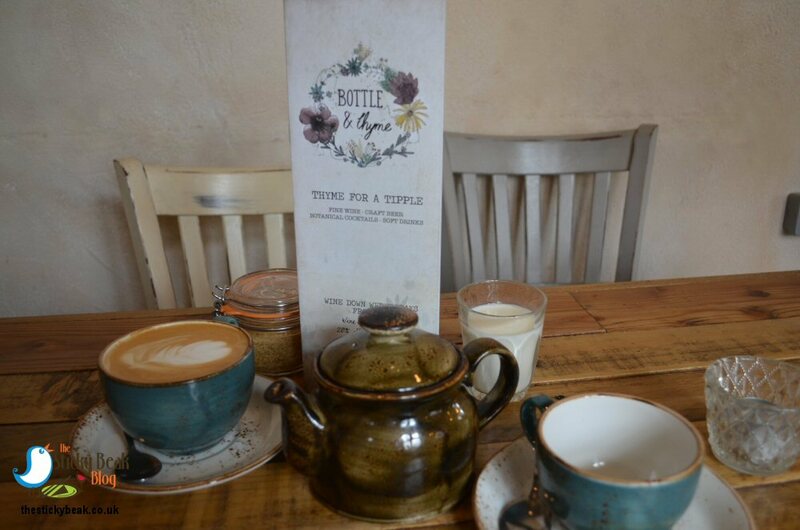 Breakfast at Bottle and Thyme In Chesterfield. It’s seems ages since The Man Bird and I went for a lazy weekend breakfast; I’m sure it isn’t really that long, but it seems it! Anyhow, with it being our anniversary weekend, and Chickadee off gallivanting with my Bestie and Niece, it was the perfect excuse to indulge. His Nibs needed some new trousers, so Chesterfield seemed ideal – we could nip into Debenhams and get his kit sorted, and then wander into town for some snap. 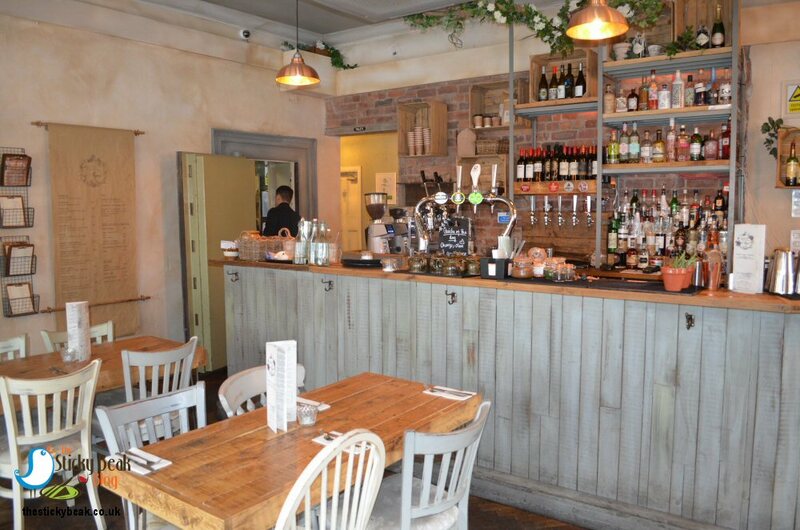 Luckily, we got the trousers sorted straight away, so that was a stress-free start to the day, and we’d rung ahead to reserve a table at Bottle and Thyme so no hassle there either! 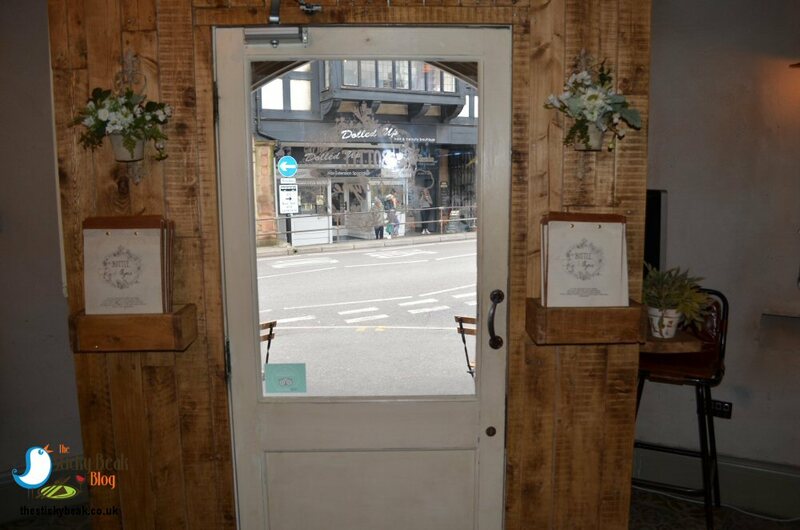 Given its location in the old bank building, Bottle and Thyme has a fab entrance – a lovely old, solid stone arched doorway. It was pretty lively when we rocked up, but the space has been left open-plan so it doesn’t feel cramped at all. I noticed that there was a nice amount of privacy space between the tables as well, something that always pleases me – I know, I’m a picky bird! 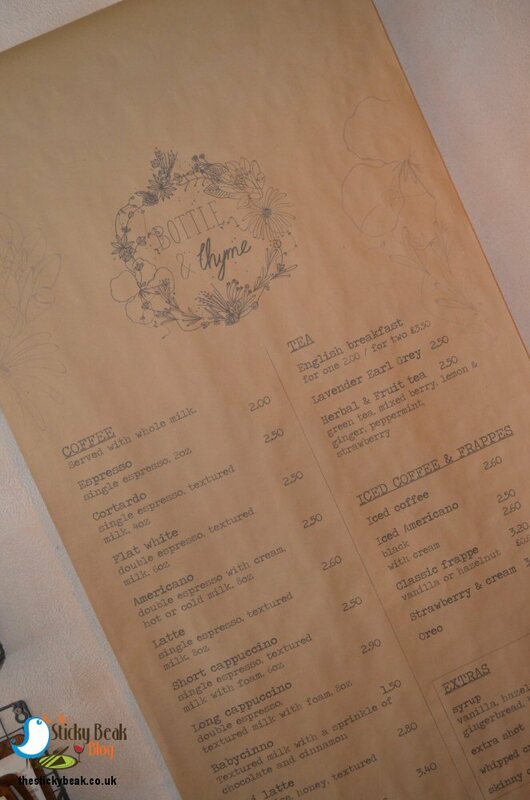 So we get sat down and a lovely young man brings over the food and drinks menus for us to have a gander at; I do my usual thing of gawping around at the decor and furnishings etc etc, and His Nibs gets his camera out and starts snapping. I loved the parquet wood flooring; it always reminds me of my old infants’ school, the main hall had the same herringbone pattern.The walls in old buildings are never straight (or flat), so the walls had been cleverly painted with cream textured paint to minimise their imperfections; muted sage green skirting, exposed brickwork, and wood panels added to the charm of the venue. Faded shabby-chic floral pads kept our bottoms comfy as we sat in the farmhouse wooden chairs that had been painted in cream and light grey tones. Artificial foliage surrounded the doorway and adorned the ceilings to soften the look further. In the mornings I need a caffeine fix to wake me up, so a skinny latte (save calories where you can is my motto!) was in order for me; The Boy Wonder fancied a Lavender Earl Grey – get him, Mr Swank! 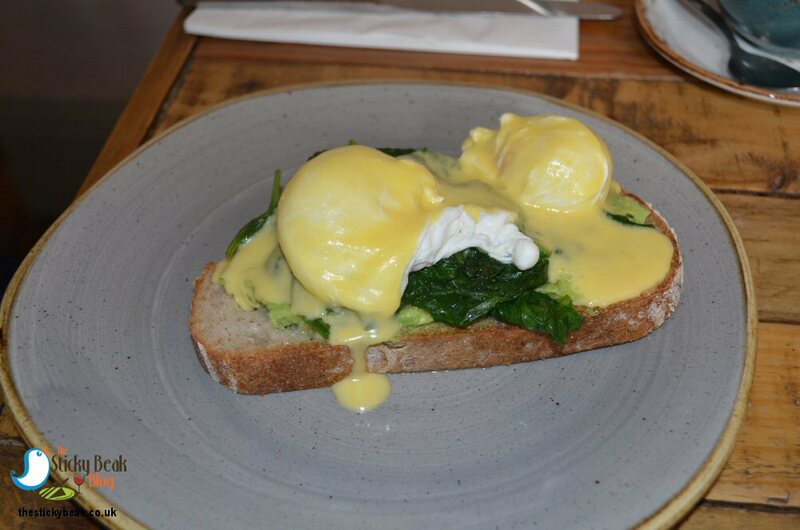 I liked the sound of the Eggs Benedict, with the addition of Avocado, as the 2 poached eggs come with buttered Spinach as well as the hollandaise sauce on the toasted sourdough. As per usual His Nibs was having his beloved Full English; Bottle and Thyme put their own twist on it with Smoked Streaky Bacon (instead of the usual Back Bacon), Baby Spinach, and Black Pudding Hash featuring alongside the usual country Sausage, button Mushrooms, grilled vine Tomatoes, fried egg, Beans and toasted sourdough. Whilst we waited for our food we sipped at our drinks, taking in the chatter of the venue. 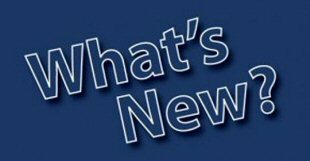 I noticed there was a good mix of clientele in ranging from families with smaller children, groups of friends (young and old age groups), and couples such as ourselves. We didn’t have to wait overly long for our brekkies to arrive, the standard time you would expect for food that’s cooked to order. There was no messing about – we got stuck straight in! I had a good thick slice of sourdough that was piled with gorgeously glossy buttered Spinach, chunkily smashed Avocado, 2 perfect little spheres of poached egg, and a coating of Hollandaise. I cut into the eggs and their runny yolks oozed down over the shades of green underneath them, a rather pretty effect I thought. The eggs’ yolks were wonderfully rich-tasting and the whites had been poached through -I hate the “snot” effect of under-done egg white, it makes me gip! Further creaminess was provided by the Avocado and I loved the fact that the buttered Spinach still had some texture to it; it kept the palate interested. Every mouthful was delicious; I’d definitely go back and eat that again. His Nibs was wolfing his plateful down like it was going out of fashion, pausing only to answer my questions! 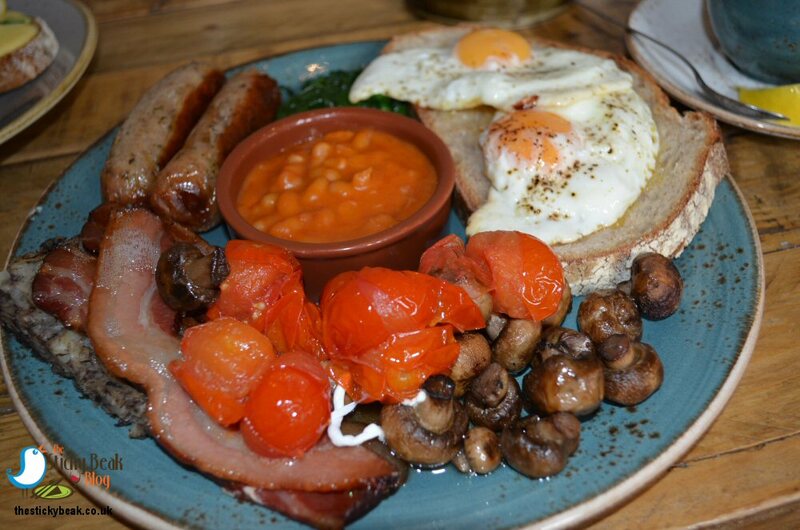 The country sausages were fat meaty affairs with a gentle herbiness to them, not as much as you’d find in a Lincolnshire sausage, but more than the standard butchers’ sausage. As with my eggs, the richness of the yolks came shining through, and partnered jolly nicely with the deep flavour of the potato and Black Pudding Hash. You can’t beat Streaky Bacon when it’s cooked nice and crispy, and the Chef at Bottle and Thyme had nailed it perfectly. I pinched the dinky button mushrooms; I don’t think The Man Bird will ever eat “slugs” as he calls them. Suits me just fine! He did dig in to the super-sweet, grilled vine Tomatoes though, and the Spinach and beans soon disappeared too. At this point we’d normally sit back, finish our drinks, pay the bill, and head off – which is what we’d planned to do until I overheard the young server telling the table next to us about the cakes on offer. As well as Choc brownie, they had a salted caramel version, and a gluten free Lemon and Raspberry sponge on the menu that morning. 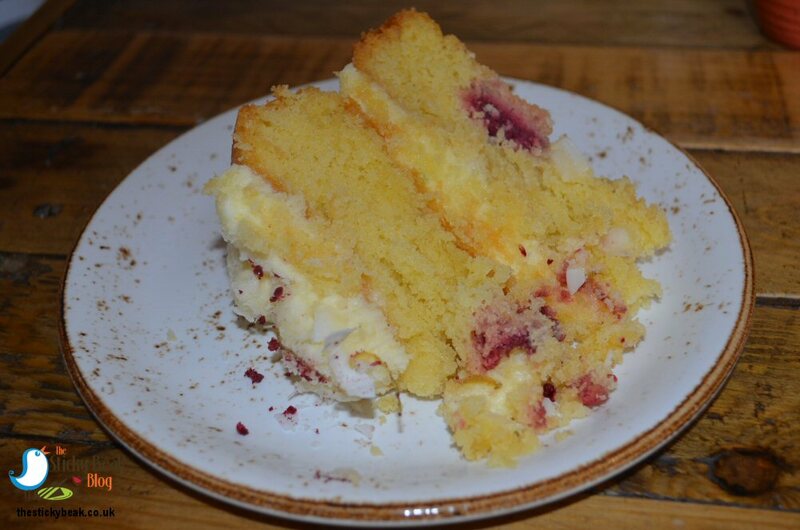 I don’t know what it was that got my mouth watering, but I just fancied a slice of the Lemon and Raspberry sponge! We shared a slice of it between us – good job really as it was a fair old wodge. What a beauty it was too; lighter-than-air sponge with whole Raspberries baked in amongst it, and a pleasing citrus note on the tongue. There was a nice layer of buttercream in the middle, and a further buttercream layer on the top which had coconut flakes on it. After demolishing our bonus bite, we paid the bill and went on our merry way. The customer service was brilliant and several checks were made as to our satisfaction with the food and whether we needed more drinks etc. 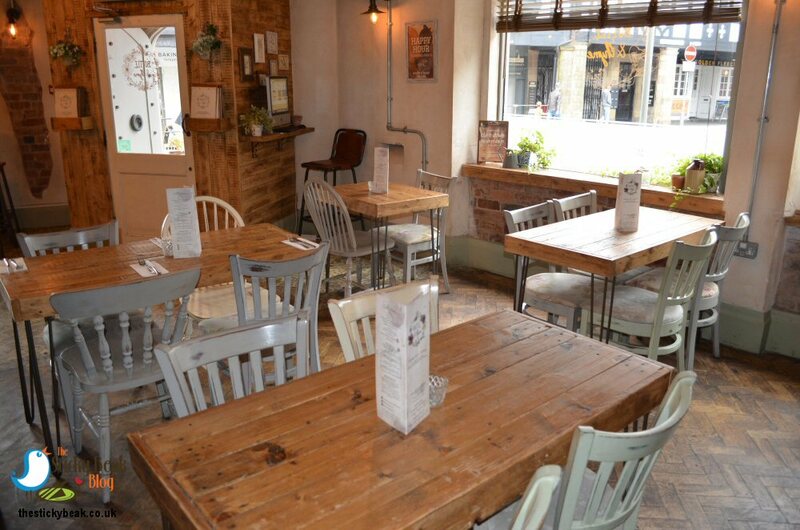 Tables were swiftly cleaned when people left and re-laid with fresh cutlery and napkins, ready for the next customers. 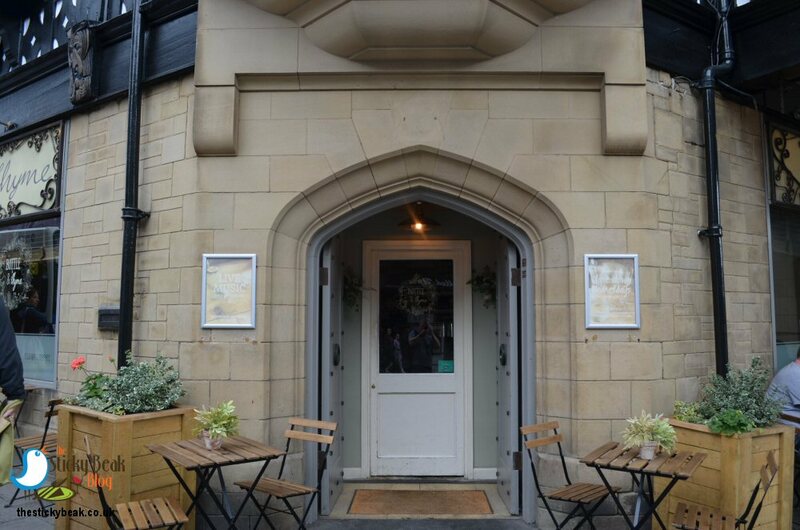 Given the quality and quantity of the food, and the friendliness of the staff, it’s easy to see why this venue won awards at the Chesterfield Food and Drink awards we attended in October 2017. Hot Wings awarded to this friendly, welcoming team.